The PMPS-300 Make and Place System is manufactured by GGA Packaging. 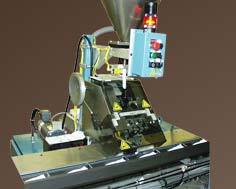 The PMPS-300 Packet Make and Place System is designed to form, fill, seal, cut and place packets on the conveyor of the wrapper system. The PMPS includes the positive make and place outfeed to ensure packet position in the conveyor. The snap action take-away will enhance knife life. Dedicated size 1 1/4" x 1 1/2"